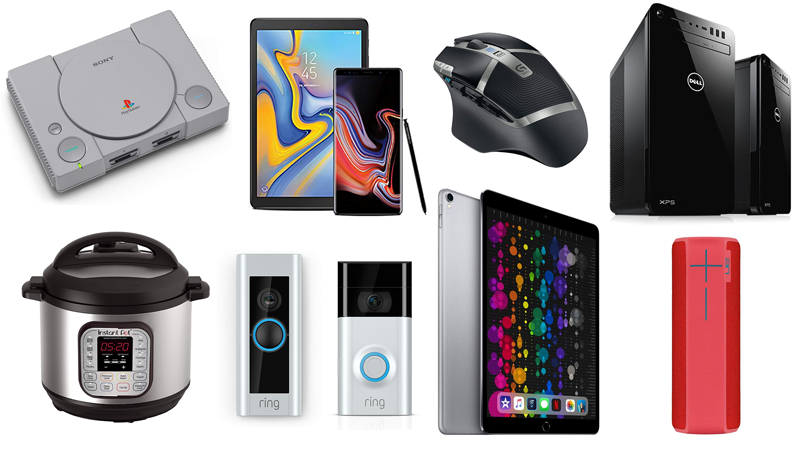 If you don't want to hop on the Apple wagon, though, fear not: we also have deals on the Xbox One X, Nintendo Switch games, Netgear's Orbi mesh router, Logitech mice, Anker headphones, Instant Pots, and, if you want to hack it, the PlayStation Classic. Have a look for yourself below. Apple iPad (32GB, 2018) for $249 at Amazon (list price $329). Apple iPad (128GB, 2018) for $329.99 at Walmart and Amazon (list price $429). 10.5″ Apple iPad Pro (64GB, Space Gray) for $499.99 at Amazon (list price $649). Apple Watch Series 3 (42mm) Smartwatch for $229 at Amazon (list price $309). Microsoft Xbox One X (1TB) + NBA 2K19 for $349.99 at eBay (list price $499.99). Netgear Orbi RBK33 Wall-Plug Mesh Wi-Fi System (5,000 sq. ft) for $198 at Amazon (clip $40 coupon – list price $299.99). 25″ Dell U2518D UltraSharp Monitor – 2560×1440, IPS + $100 Dell Gift Card for $329.99 at Dell (list price $449.99). Amazon Kindle Paperwhite (8GB, 2018) for $99.99 at Amazon (list price $129.99). Logitech G602 Wireless Gaming Mouse for $29.99 at Walmart and Amazon (list price $79.99). Anker Soundcore Spirit X Bluetooth Sports Headphones for $25.99 at Amazon (list price $41.99). Mario + Rabbids Kingdom Battle (Switch) for $19.99 at Google Express and Walmart (list price $59.99). Microsoft Xbox Controller + Wireless Adapter for Windows 10 for $49.95 at Walmart and Amazon (list price $59.99). Instant Pot DUO80 8-Qt Electric Pressure Cooker for $99.95 at Amazon (list price $139.95). Azul Board Game for $27.49 at Amazon (list price $34.99). 10.5″ Apple iPad Pro (512GB, Gold) for $799 at Amazon (list price $999). Apple Watch Series 3 (38mm) Smartwatch for $229 at Target and Best Buy (list price $279). Apple MacBook Air – 1.6GHz Intel Core i5-8210Y, 13.3″ 2560×1600, 8GB RAM, 256GB SSD for $1,249.99 at Amazon (list price $1,399). Amazon Echo Plus (2nd gen) + Philips Hue Smart Bulb for $119.99 at Amazon (list price $164.98). Amazon Smart Plug for $19.99 at Amazon (list price $24.99). Amazon Fire 7 (3-Pack) for $109.97 at Amazon (list price $149.97). Amazon Fire HD 8 (3-Pack) for $179.97 at Amazon (list price $239.97). Asus ZenBook 13 Laptop – Intel Core i5-8250U, 13.3″ 1080p, 8GB RAM, 256GB SSD for $749.99 at Amazon (list price $799.99). Dell Vostro 13 5000 Laptop – Intel Core i7-8550U, 13.3″ 1080p, 8GB RAM, 512GB SSD for $899 at Dell (list price $1,570). MSI GV62 Laptop – Intel Core i5-8300H, 15.6″ 1080p, 3GB GTX 1060, 256GB SSD for $799.99 at Walmart (list price $999.99). Dell XPS 8930 Desktop – Intel Core i7-8700 6-core, 16GB RAM, 1TB HDD for $699.99 at Dell (use code: AFF300XPS – list price $999.99). Dell XPS 8930 Gaming Desktop – Intel Core i9-9900K 8-core, GTX 1080, 32GB RAM, 256GB SSD + 2TB HDD for $1,779.99 at Dell (use code: 50OFF699 – list price $2,079.99). HP Pavilion 590 Desktop – Intel Core i5-8400 6-core, AMD Radeon RX 550, 16GB RAM, 1TB HDD (Refurb) for $479.99 at PCMag Shop (list price $899.99). Pokemon: Let's Go, Eevee! (Switch) for $47.92 at Amazon (list price $59.99). Splatoon 2 (Switch) + Bonus Strategy Guide for $45.49 at Walmart and Target (list price $59.99). Super Mario Odyssey (Switch) for $48.99 at Walmart (list price $59.99). Red Dead Redemption: Game of the Year Edition (XB1) for $9.99 at Best Buy (list price $19.99). NBA 2K19 (PS4, XB1, Switch) for $29.99 at Amazon (list price $59.99). 55″ Vizio D55x-G1 4K LED TV for $379 at Walmart (list price $478). 49″ LG 49UK6090PUA 4K LED TV + $100 Dell Gift Card for $349.99 at Dell (list price $449.99). 55″ Samsung UN55NU7200 4K LED TV + $20 Vudu Credit for $498 at Walmart (list price $548). Anker Nebula Prizm II Projector – 3600 Lux, 1080p, LED for $199.99 at Amazon (use code: PZM4EVER – list price $299.99). Logitech Harmony 650 Universal Remote (8 Devices) for $34.99 at Amazon (list price $89.99). Logitech G933 Artemis Spectrum Wireless Gaming Headset for $99.99 at Dell (list price $199.99). Aukey Latitude EP-B40 Bluetooth Sports Headphones for $17.99 at Amazon (use code: WCITQDNR – list price $25.99). Samsung 970 EVO (500GB) NVMe PCIe M.2 SSD for $119.99 at Amazon (list price $129.99). Samsung EVO Select (128GB) MicroSD Card for $22.99 at Amazon (list price $24.99). Samsung Galaxy Note 9 (128GB) Unlocked Smartphone + Galaxy Tab A Tablet for $999.99 at Amazon (list price $1,189.85). WD Blue (500GB) 3D NAND SATA SSD for $57.99 at Amazon (list price $72.99). Tile Mate (4-Pack) Bluetooth Tracker for $49.99 at Amazon (list price $59.99). Tile Mate + Tile Slim (4-Pack) Bluetooth Tracker for $49.99 at Amazon (list price $69.99). UE Megaboom Portable Bluetooth Speaker for $89.99 at Dell (list price $299.99). UE Wonderboom Portable Bluetooth Speaker for $49.99 at Dell (list price $99.99). Anker PowerWave Wireless Charger – 10W, Qi for $11.99 at Amazon (clip $1 coupon – list price $23.99). Netgear Orbi RBK33 Wall-Plug Mesh WiFi System (5,000 sq. ft) for $198 at Amazon (clip $40 coupon – list price $299.99). Google WiFi AC1200 Mesh WiFi System (3-Pack) for $239.99 at Amazon (list price $299). Silicon Power Armor A60 (2TB) Rugged USB 3.0 Portable HDD for $59.99 at Amazon (list price $134.99). SanDisk SSD Plus 480GB 2.5″ Internal SSD for $59.99 at Amazon (list price $69.99). AmazonBasics Standby UPS – 800VA, 450W, 12-Outlet for $51.99 at Amazon (list price $79.99). August Smart Lock (Dark Gray, 3rd gen) for $94 at Amazon (list price $149.99). ChefSteps Joule 1100W Sous Vide for $144 at Amazon (list price $179). Mainstays LED Desk Lamp with Qi Wireless Charging + USB Port for $10 at Walmart (list price $19.99). LEGO Star Wars Episode VIII First Order Heavy Assault Walker 75189 Building Kit (1,376 Pieces) for $109.95 at Walmart and Amazon (list price $149.99).